You may remember my previous article about GABA and the accompanying discussion I had with my friend Carl Lanore on Super Human Radio in 2013 (learn more); and if you do, you will probably also remember that I have mentioned that some people have a paradoxical reaction to GABA. Instead of getting tired, they get wired. Whether that's related to the likewise previously discussed effects on glucose management and a potential stress response to hypo-glycemia is not clear and I have to admit: The latest GABA study does not provide an answer to this question either. Phenibut Addic- tive or Harmless? Melatonin = Easy Fat Loss? What Yamatsu's study does provide, however, is very good evidence that γ-aminobutyric acid (GABA) acts as a potent sleep aid in the average Japanese... about as average as the ten subjects (average age: 37.7±11.5, age range: 24-57, 6 male subjects and 4 female subjects), who were suspected to have small sleep disorders but were not patients, that participated in this study. Yamatsu et al. used a randomized, single-blind, placebo-controlled, crossover-design, according to which the ten subjects were randomly divided into two groups of five people each (group 1 and group 2). The main study consisted of two intake periods (1 week each) and a wash out period (1 week) between the intake periods. During the first intake period, subjects in groups 1 and 2 took GABA and the placebo, respectively, 30 min before going to bed everyday for a week. During the second intake period, the treatments were exchanged between groups (i.e. subjects in group 1 and group 2 took the placebo and GABA, respectively). 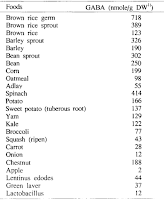 GABA content of selected uncooked foods (Yamatsu. 2016). "For two consecutive nights three days prior to each intake period, the subjects went to bed wearing the EEG instrument for adaptation. On the night prior to each intake period, EEG recordings were obtained while the subject was sleeping to serve as the baseline data. EEGs were also collected on the last night of the intake periods. On days that EEGs were recorded, alcohol and drugs, such as cold medicine and hypnotics, were prohibited. In addition, food and drinks, such as coffee, tea, and other items that might affect natural sleep, were also prohibited 2 h before going to bed. Subjects were requested to maintain constant lifestyle patterns regarding their eating habits, exercise, daily work, and so on throughout the study" (Yamatsu. 2016). On the day following the EEG measurement, subjects evaluated their sleep with respect to ease of falling asleep, feelings upon awakening, and satisfaction with sleep by using visual analog scores (VAS). Subjects gave high scores if they felt positive effects from the test samples. In addition to VAS, Pittsburgh Sleep Quality Index (PSQI | Burysee. 1989) was used to evaluate the sleep quality of each subject. Serum GABA levels over time (Yamatsu. 2016). How do we know 30 minutes before bed if optimal? In a follow up study, the researchers were given 100 mL of water with 200 mg of GABA (more for the dose-response (2) vs. the sleep study (1) study), in order to determine the exact plasma GABA kinetics over 60 minutes. What they found is the data in the figure on the left that clearly indicates that the GABA levels and thus probably its effects peak after 30 minutes. Whether this means that your sleep will be the deepest or most recuperative with this timing cannot be guaranteed, though. 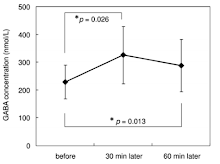 And this evaluation yielded quite interesting results: Oral administration of 100 mg of GABA significantly shortened sleep latency by 5.0 min (p=0.020, Fig. 1A, left). The mean value of sleep latency of subjects before GABA administration was approximately 10 min, and their sleep latency after GABA administration was reduced by half. Figure 1: EEG data and subjective data from the VAS and PSQI test (Yamatsu. 2016). "These results indicate that GABA may help people fall asleep quickly and easily. In other words, GABA exhibited its effect during the early stage of sleep. Besides shortening sleep latency, GABA significantly increased total non-REM sleep time by 2.2% (p=0.040, Fig. 1E). This is favorable because non-REM sleep is a deeper sleep and is thought to rest both the brain and the body. In particular, the time from falling asleep to the first REM sleep, which was in the early stage of sleep and consisted of light and deep non-REM sleep, was longer in the GABA group compared to the placebo (data not shown). This also indicated that GABA was effective, especially during the early stage of sleep" (Yamatsu. 2016). The results of sleep evaluation by VAS questionnaires and PSQI are shown in Fig. 1 on the right hand side: Every item of VAS and PSQI was improved in GABA group. For the scientists, that's sufficient evidence that "subjects in the present study felt certain effects after use of GABA". 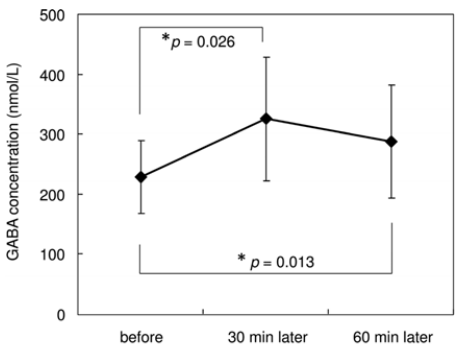 Now that's cool, but what is even more important than the subjects felt any effect is that their "feelings upon awakening were significantly improved" (p=0.025, Fig. 1A, right | Yamatsu. 2016). This is important, because some drugs used for sleep treatments are so strong that people will feel drowsy and tired on the next morning, in spite of sleeping more than usual. Compared to these drugs, i.e. benzos and co, GABA is thus not just safer and over-the-counter available, it will also leave you less winded on the next AM. Unfortunately, it is questionable, whether GABA strong enough for people with severe sleep disorders - personally, I doubt that. Bottom line: In view of the previously discussed beneficial effects on growth hormone and glucose management, GABA is an interesting supplement for anyone. Its ability to shorten sleep latency and increase the total non-rapid eye movement (non-REM) sleep time, however makes it even more attractive for people with mild sleep disturbances and people who love to mess with their biorhythm to fine-tune it even further. From the slightly sarcastic tone in the last sentence of the previous paragraph, you may already have concluded that I am not going to suggest everyone should supplement GABA: no long-term data, no real need... so you better only consider it, if you have sleep issues | Comment! Buysse, Daniel J., et al. "The Pittsburgh Sleep Quality Index: a new instrument for psychiatric practice and research." Psychiatry research 28.2 (1989): 193-213. Oh, Suk-Heung, Yeon-Jong Moon, and Chan-Ho Oh. 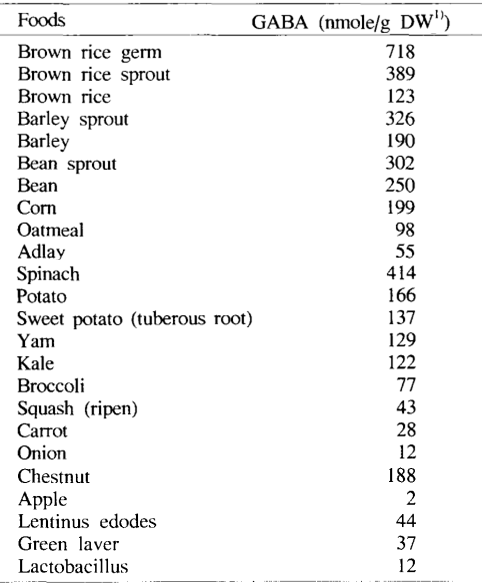 "γ-Aminobutyric acid (GABA) content of selected uncooked foods." Preventive Nutrition and Food Science 8.1 (2003): 75-78. Yamatsu, Atsushi, et al. 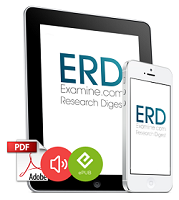 "Effect of oral γ-aminobutyric acid (GABA) administration on sleep and its absorption in humans." Food Science and Biotechnology 25.2 (2016): 547-551.